Bensaada's writing is unusually clear and concise. Thus I highly recommend the book, even where readers have only limited knowledge of French. More than half the reference links are to English sites. That alone, in my opinion, is more than worth $11.08 for a print copy . 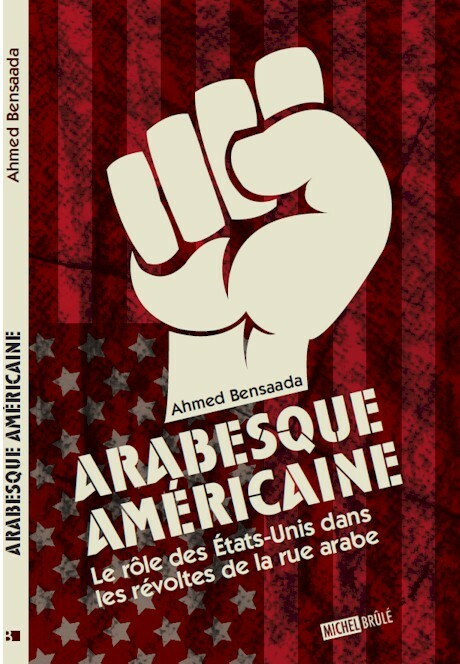 In tracking down sources for an upcoming presentation on the antiglobalization movement, I have come across a little gem called Arabesque Americaine by French Canadian author Ahmed Bensaada. The full title is Arabesque Americaine: Le role des Etats-Unis dans les revoltes de la rue arabe -- translated American Arabesque: the Role of the US in the Revolts in the Arab Streets. I have been increasingly skeptical of the authenticity of the "Arab Spring" revolutions -- especially in Egypt (where the outcome is a military junta) and Libya (which, like Iraq , has been bombed back to the Middle Ages). Last February, a few blogs mentioned a 2009 meeting between Hillary Clinton and one of Egypt 's (presumably) US funded pro-democracy groups. Then the English alternative media and blogosphere went all quiet on the issue. Arabesque Americaine leaves absolutely no doubt that the "Arab Spring" -- like the earlier "color revolutions" in eastern Europe -- were almost certainly destabilization/regime change operations, funded and orchestrated by the CIA, State Department, historic CIA-funded foundations -- and last, but not least, Google. Bensaada's 120-page book provides a carefully researched and referenced account of each of the foundations that are "exporting democracy" to MENA (the Middle East and North Africa ), along with an exact accounting of the millions of dollars given to each country in 2009 and the specific groups the funds went to. My favorite chapter was the one describing the role these foundations, the State Department, and Google have played in training young MENA activists in the use of social media (e.g. Facebook and Twitter). I was particularly interested in the free access and training they provide international youth activists on TOR, a special software designed to evade government surveillance (which, under the Patriot Act, is illegal in the US ). Bensaada, who was born and received his early education in Algeria devotes special attention to the Egypt revolution, emphasizing the role Google played via their star employee Wael Ghonem. Chapter 1 -- concerns the secret American funding and orchestration of the so-called "color revolutions" in Eastern Europe , with particular focus on Serbia (2000), Georgia (2003), Ukraine (2004) and Kirghizistan(2005). In each case, pro-Soviet governments were overthrown by mobilizing disaffected, pro-Western young people -- financed by the CIA, State Department, and Pentagon linked "democracy manipulating" foundations. The latter include National Endowment for Democracy (NED), National Democratic Institute for International Affairs (NDI), Freedom House (FH), the Albert Einstein Institute, the Center for Non Violent Action and Strategies (CANVAS), the United States Agency for International Development (USAID) -- and George Soros' Open Society Institute (OSI). Chapter 2 -- contains a detailed discussion of the above think tanks and foundations, which includes a description of the their government funding, as well as the subversive activities (espionage, election rigging, an popular destablization activities) they promote in countries like Venezuela, Bolivia, Cuba and Iran that oppose America's pro-corporate agenda. Chapter 3 -- discusses the promotion, by the State Department and these think tanks and foundations, of new technologies in these destabilization campaigns. I was fascinated by Bensaada's description of Guide Star's TOR Project, which permits anonymous navigation of the Internet. According to their own website, TOR is funded by Google, the US Naval Research Lab, and Human Rights Watch (HRW). In 2004 Paul Treanor documented that HRW is a joint project of Soros' Open Society Institute and the State Department ( http://web.inter.nl.net/users/Paul.Treanor/HRW.htm). US Wikileaks spokesperson Jacob Appelbaum, the main TOR spokesperson, travels all over the world training activists in the use of TOR (Wikileaks uses TOR on their servers). Chapter 3 also discusses the role of Movements.org and the Alliance of Youth Movements in promoting the use of social media to international youth activists (once again, Bensaada points out that promoting protests via social media is illegal in the US -- he cites the example of an activist arrested at the 2009 G20 Summit in Pittsburgh). Movements.org is run by Jared Cohen, the director of Google Ideas and a former advisor to both Condolizza Rice and Secretary of State Hillary Clinton and Jason Libman, another Google employee formerly employed by both the State Department and the Pentagon. AYM executive director David Nassar was formerly employed by NDI, USAID and IRI. The list of luminaries who participated in a 2008 Summit focused on teaching international activists how to use Facebook and Twitter is also extremely enlightening: Sherif Mansour from Freedom House, James Glassman from the State Department, Larry Diamond from NED, and national security advisor Shaarik Zafar. Chapter 4 -- focuses on the specific case of Egypt, with particular attention to the role played by Google employee Gael Ghonem, who was given paid leave from his job (Google's chief of marketing for MENA) to participated in the Tahrir Square uprising. Ghonem was responsible for creating the Facebook page "We are all Mohamed Bouazizi" after the Tunisian fruit seller trigger the Tunisian revolution by setting himself on fire. Ghonem also created the "We are all Tal Al-Mallou" to pressure Syria to release the Syrian blogger after she was arrested for espionage activities in the Syrian Embassy in Cairo . Back in 2009, he also set up a Facebook page for Egyptian exile Mohammed El-Baradei, in advance of his February 2010 visit to Cairo to explore a bid for the Egyptian presidency. The visit, according to Wikileaks cables, was organized through the US embassy. Please note this was a full year before the Tahrir Square protests. In this chapter, Bensaada also focuses on two lead organizers in the April 6th movement (Bassam Samir and Adel Mohamed) with strong links to Washington and the "color revolutions." Chapter 5 -- focuses on the pro-democracy organizations in other Arab countries (Algeria, Bahrain, Egypt, Iraq, Jordan, Kuwait, Lebannon, Lybia, Morocco, Palestine, Tunisia, Yemen, and Syria) financed by the State Department and the "democracy manipulating" foundations. In his appendix, Bensaada identifies the specific pro-democracy groups by name and the exact amount of US funding each received in 2009. Chapter 6 -- a summation and analysis, which explores the ethical dilemma faced by many Egyptian activists on learning the non-violent materials they were using to organize demonstrations were the creation of CIA and State Department Funded think tanks and foundations. Arabesque Americaine is available in print for $16.95 from Amazon Canada (with links to discount distributors selling it for $11.08). It's also available in Epub from two sites. According to one ebook distributor, Archambault, the Epub version is only available in Canada to "protect the rights" of the author. A second site, Livresquebecois.com allowed me to pay for and download the Epub version. However the file they provided is corrupted and had to be converted to PDF (via free downloadable software) in order to read it.